You can find lots of other great performers on our Links page. 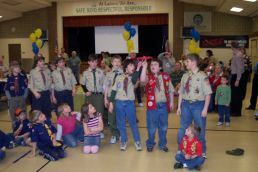 Need entertainment for your Boy Scouts, Cub Scouts, Girl Scouts or Brownies event? Contact The Flying Aces today! Whether you're planning a Blue & Gold Banquet, a Council Meeting, a Scout Camp, a party or any other occasion, you won't find a show that's more fun and entertaining for your youth organization than The Flying Aces. With high-flying antics, stunts and tricks, The Flying Aces will be a hit with the younger kids, older kids, parents and even the teenagers! Our show emphasizes physical fitness, a good work ethic, doing well in school and getting away from TV sets and video games. But the main goal of every performance is for the audience to have fun. Our shows can be set up indoors or outdoors, using any level area approximately 30'x20'. All our shows are followed by a Disc contest with autographed Flying Aces Discs for the winners. Interested in having The Flying Aces perform for you?